A couple of weeks ago it was my turn to teach the lesson during our Thursday night kids program at the church. I was teaching about Jesus telling His followers to remove the logs in their eyes before trying to help others with the specks of dust in their eyes and to demonstrate the "logs" in our eyes I had to hold a piece of 2x4 lumber up as if it were sticking out of my eye. The kids thought this was hilarious and would burst out laughing every single time! To be honest, I've always loved this passage of Scripture for the same reason. 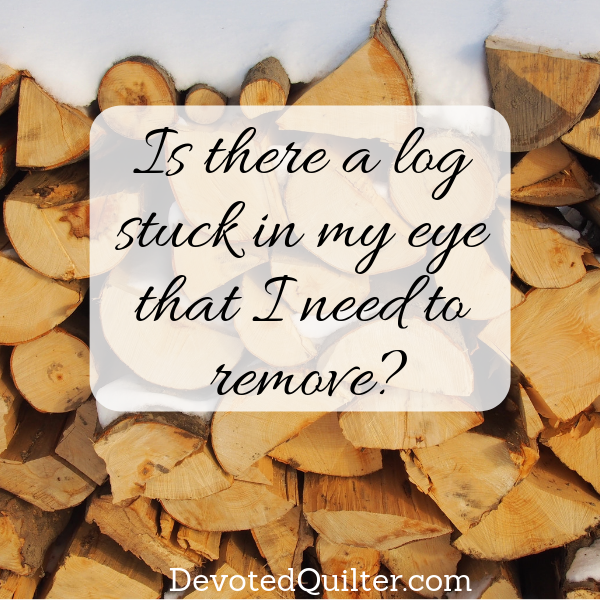 Talking about logs sticking out of our eyes is such an exaggeration that it really gets the point across. 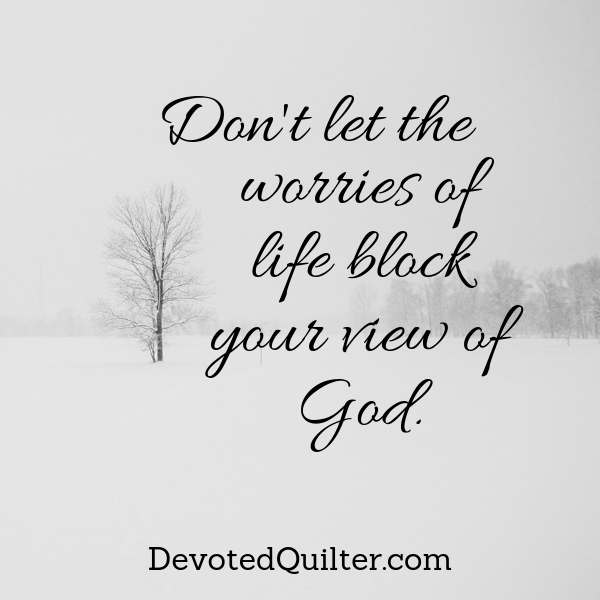 Just in case you're not familiar with it, here's what Jesus said in Matthew 7:3-5, "And why worry about a speck in your friend’s eye when you have a log in your own? How can you think of saying to your friend, ‘Let me help you get rid of that speck in your eye,’ when you can’t see past the log in your own eye? Hypocrite! First get rid of the log in your own eye; then you will see well enough to deal with the speck in your friend’s eye." Of course, Jesus doesn't mean we have actual logs sticking out of our eyes. In verses one and two of that chapter, He said, "Do not judge others, and you will not be judged. For you will be treated as you treat others. The standard you use in judging is the standard by which you will be judged." The logs Jesus talked about represented the bad things we do, which we are generally ignoring when we are worried about trying to fix all the bad things the people around us are doing. Jesus was telling His followers, including us, to worry about the sins in their own lives and then they could concern themselves with the sins of others. What I found funny that night at the kids program was that just before we left, we leaders were talking and one of the other ladies started to say something about another person. Then she stopped herself and said, "I'm judging right now. I think I have a log in my eye!" She laughed and didn't bother to finish the story she had been about to tell. Judging others is such an easy trap to fall into! People around us are constantly doing things we disagree with or things that make us think, "I would never do that." That's the wrong attitude to have for two reasons. First of all, though we may not do the specific thing we are judging the other person for, we can be sure that there are other things we do that are contrary to what God wants for us. I can't find who originally said this, but I've heard a phrase that is so appropriate: "Don't judge me because I sin differently from you." Your sins and my sins may be different, but they're still sins. “But the tax collector stood at a distance and dared not even lift his eyes to heaven as he prayed. Instead, he beat his chest in sorrow, saying, ‘O God, be merciful to me, for I am a sinner.’ I tell you, this sinner, not the Pharisee, returned home justified before God. For those who exalt themselves will be humbled, and those who humble themselves will be exalted” (Luke 18:9-14). We are never meant to have 'great confidence in our own righteousness,' but that is exactly the attitude we are operating from when we are judging others and it is the perfect example of a log that needs to be removed from our eyes. As always, there are a bunch of projects on the go at once around here 😊 One of them is a computer project for now, but it will likely result in a lot of sewing in the future. 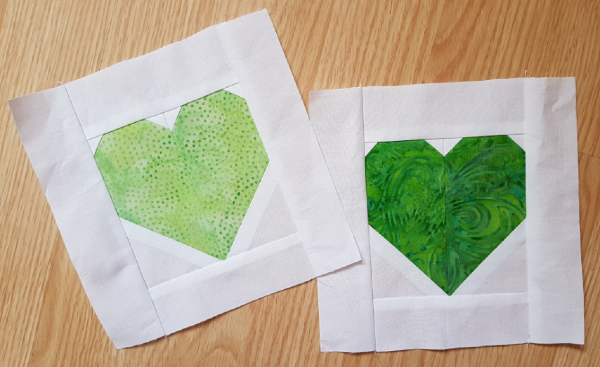 Sandra, of Musings of a Menopausal Melon, has started her 30 Quilt Designs 2019 challenge and I've jumped right in again. This is the fourth time I've participated in a 30 designs challenge and I'm still working on finishing projects from all three of the previous ones, lol. Here's my first design, which I created specifically to use the collection of colour-coordinated 4 patches I've made over the years as leaders and enders. 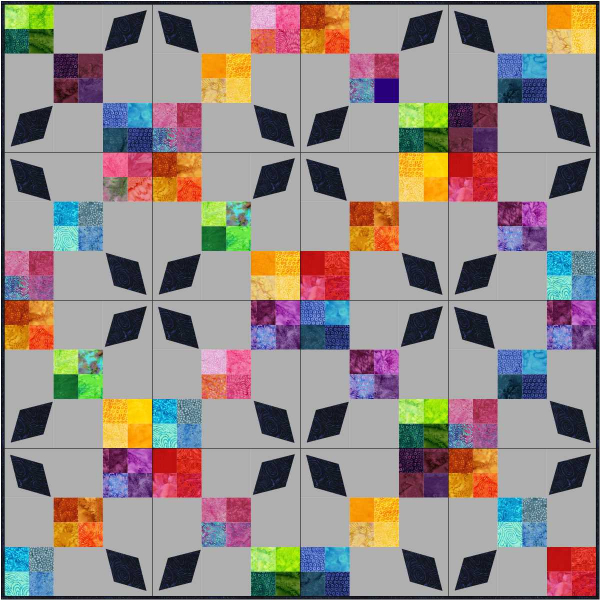 Funny enough, Scraps Squared was also designed during one of these challenges to use that same collection of 4 patches, which seems to be never ending! 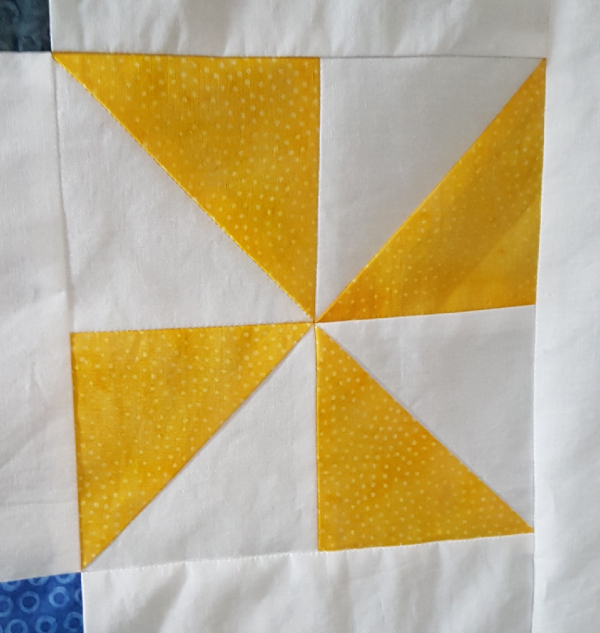 Of course, I realized after I posted it in the challenge FB group that at the size I've designed it, the 4 patch blocks would need to be 4" finished and mine are only 2"! I guess now I need to start making bigger 4 patches as leaders and enders! On a completely different note, I'm sure you were as heartbroken as I was about the shootings in Christchurch, New Zealand. The amount of hate some people feel just boggles my mind. If you're looking for a way to show love and support for the people affected by the attack, you can make a 6 ½" heart block (or several) to send. All of the instructions and the address for mailing the blocks can be found here. I mailed my blocks yesterday and when the postmaster noticed that the envelope was going to New Zealand he made a comment about the sadness of the situation there. 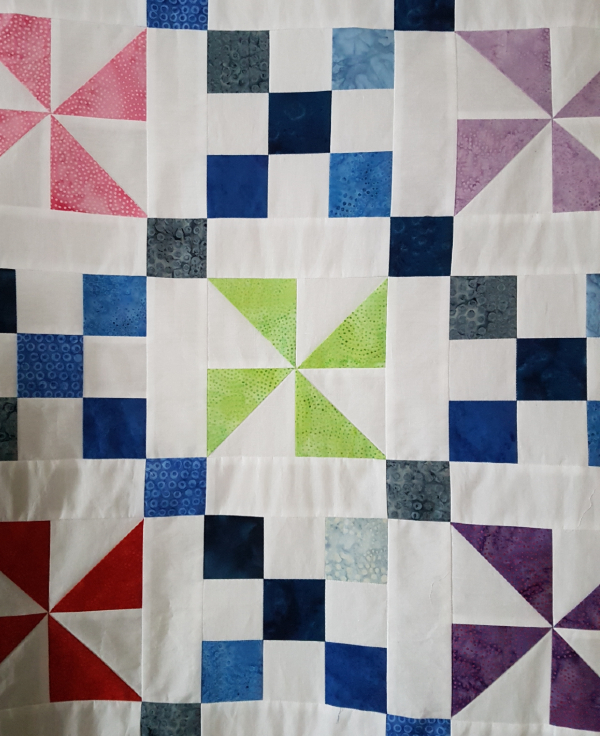 He is familiar with the concept of mailing quilt blocks for projects like this as he was the one dealing with the sudden surge of mail into our box two years ago, so I explained I was mailing blocks for people to make quilts for the families. He just nodded and said, "So you quilters are just like one big family then." 😊 Doesn't that do your heart good? I've also been working on my Island Batik March challenge. The challenge this month is Vintage Reimagined, so we're to take a vintage quilt or pattern and make it more modern. 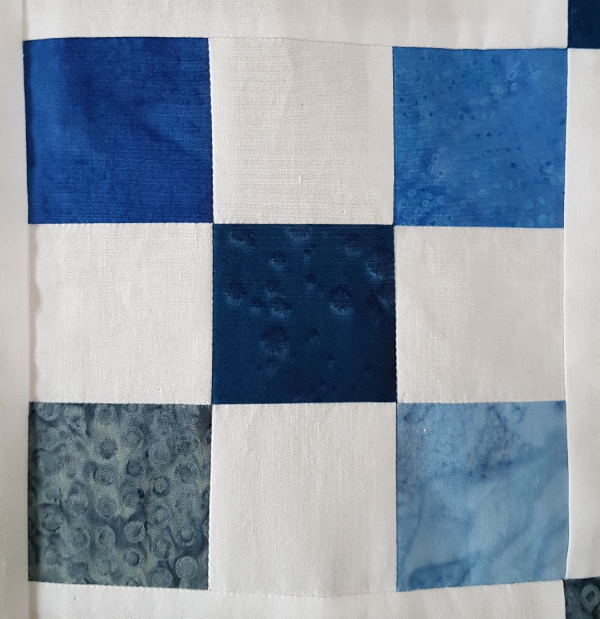 I'm combining a blue Irish Chain and bright pinwheel blocks with Island Batik's solid white to make my quilt. All of the blocks are made, so now it's time to cut all of the sashing pieces and get to the assembly. This will also be my contribution for Sarah's Hands 2 Help Comfort Quilt Challenge and it will be going to Victoria Quilts Canada. Are you participating in Hands 2 Help? Sarah has a variety of charities to choose from, so there's likely one that you would be interested in supporting and although the official sign up week is past, more participants are always welcome. I'm also working on these placemats for my MIL. We won't talk about how these are her gift for Christmas 2018 (shhhh!). I used the Missouri Star Layer Cake Dresden ruler, which I also used for my Dresden Log Cabin quilt back in November. I found I had a little extra fullness this time, so it took a lot of pins to tame the dresden in order to applique it to the background. There's still a bit of waviness, but I think I'll be able to quilt it into submission. 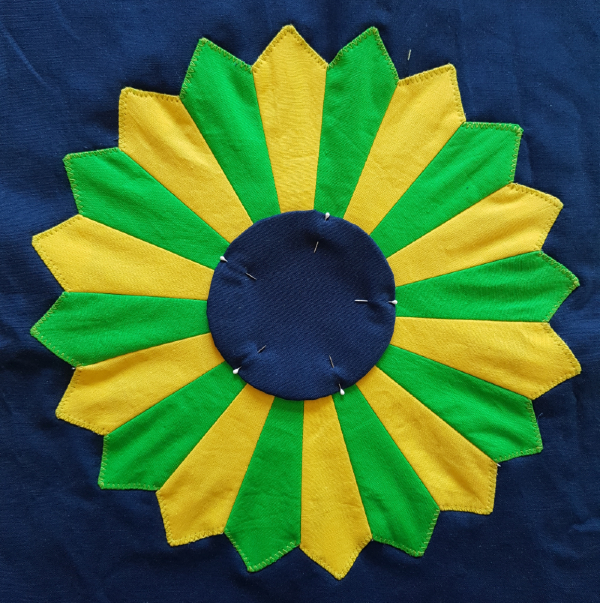 When I made the center circle for the mini back in November, I used large basting stitches before pulling the fabric around the template and I found the circle wasn't really smooth. This time I used small basting stitches and the circles are much smoother around the edges. I've been waiting for some navy Aurifil thread to arrive and it was in my mailbox this morning (along with some friends), so now I can get those center circles appliqued on. The navy thread is 2785, the aqua is 5005 and the cone is a replacement for my 2600 that is almost gone. That's what's keeping my occupied these days 😊 What are you working on? March 15th - Center star - we're here! Here's my original Medallion Magic, made with Northcott fabrics. Yep, I still love it! And here's my new center star, in Island Batik Paisley Park fabrics. It's giving the original some serious competition, don't you think? I love the rich, elegant feel of the purple and doesn't the teal just seem to glow? I know I've raved about Island Batik neutrals in the past, but I have to do it again for this one. This creamy white is called Almond. It's speckled with tiny dots and it's perfect 😊 I'll take a whole bolt of it, please, and throw in a bolt of the purple while you're at it! 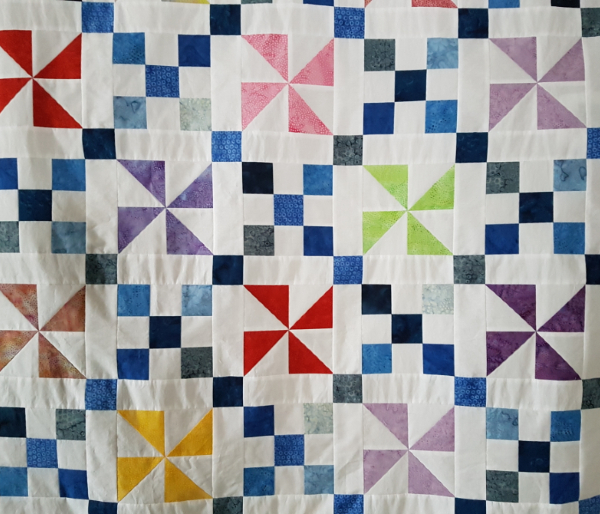 Putting the center star together calls for some flying geese and some HSTs, both of which require drawing diagonal lines on the fabric as guides. I find I get much more accurate results when the pencil I'm using is really sharp, which always makes me think of my junior high shop class. One of the projects involved drawing elevation diagrams and my teacher was insistent on us twirling the pencil as we drew each line to keep the point from wearing down on one side. The twirling was meant to produce the thinnest possible line, though I never mastered the proper twirling technique. I do find myself twirling my pencil as I draw guide lines, though, and it does make for a thinner line, so I gained something from the class, even if I've never again drawn an elevation diagram. All of that to say, my tip for this month is to try twirling your pencil as you draw your guide lines. Maybe you'll find it increases your accuracy, too. 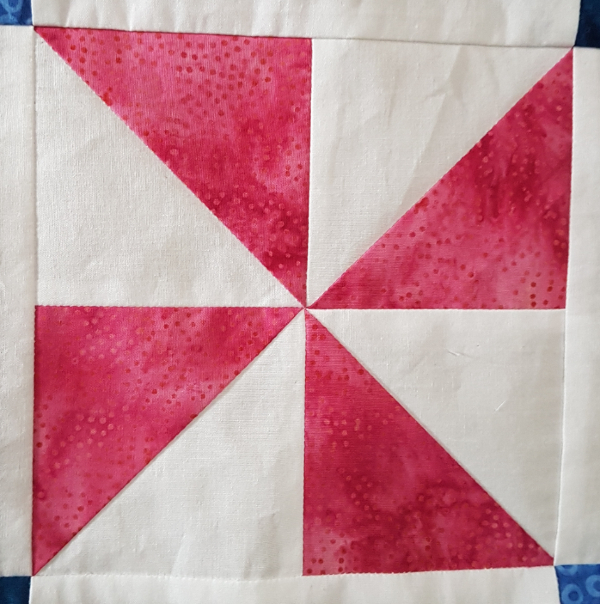 Do you have any tips to share for making flying geese or HSTs? I do love when points are pointy, don't you? I'm pleased to get to release a new pattern today 😊 Meet Night Sky. 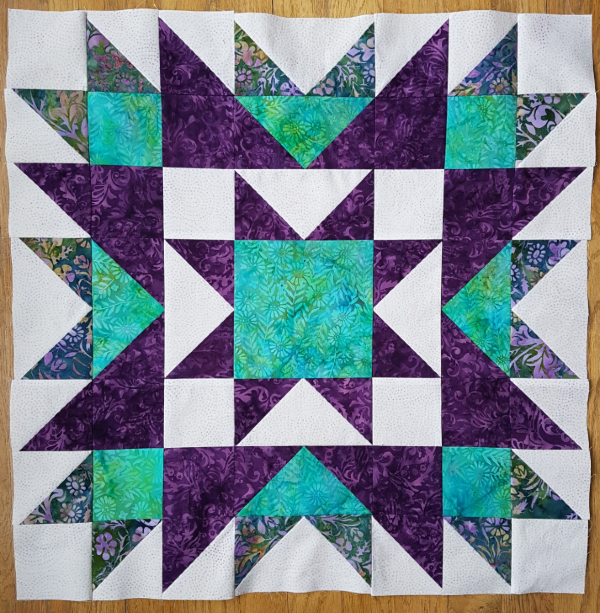 This quilt uses only two fabrics to make a bold, striking quilt that comes together quickly. Night Sky includes three size options - a 42" x 42" baby, the 60" x 72" throw size shown and a 90" x 90" queen size. It's good to have options, don't you think? What size quilt do you make most often? The sample quilt was made with Michael Miller fabrics, a Cotton Couture blue solid and the black sequin print from the Glam Girls line by American Dream House. The sequin print is so fun and I'm sad that I only have a little bit left of it now. 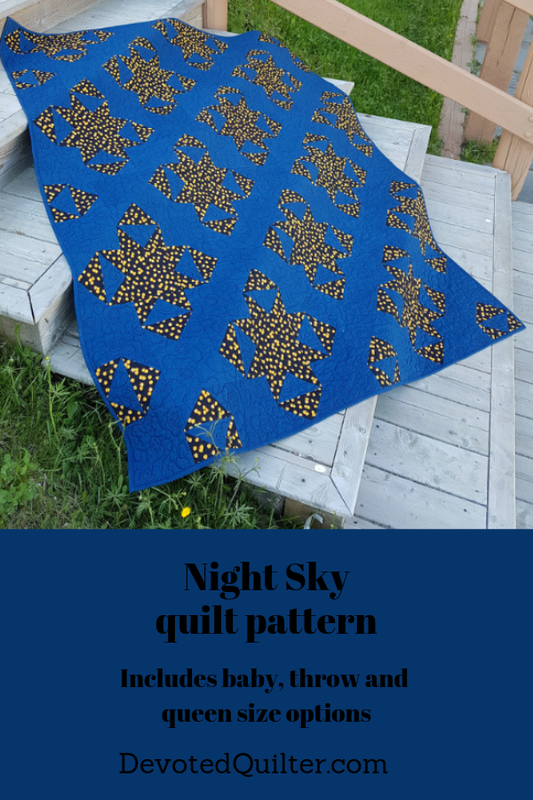 I have to admit that while I love the simplicity of a two fabric quilt, I am curious about what Night Sky would look like if every star were a different colour. 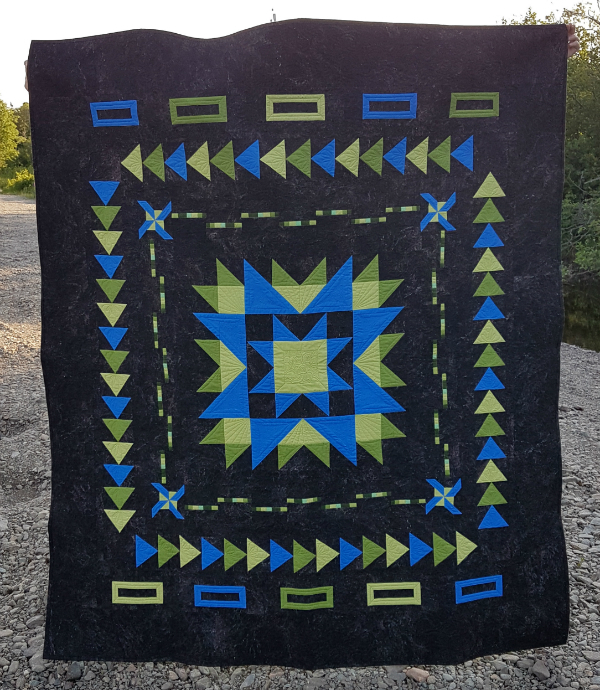 Actually, the night I finished the quilt top I sent a picture of it to my friend Michelle, then almost immediately I sent another text saying I wanted to make another one in all the colours! It hasn't happened yet, but working on the pattern to get it ready for this release has really kindled that fire again. I feel like lately I want to make everything scrappy and colourful, lol. I've been asked in the comments, so I thought I'd edit to answer here - a fat quarter would be enough to make one star, so if you want to go scrappy, then your collection of fat quarters would be perfect for it. Night Sky is available at its introductory price through March 21st (Nathan's birthday 😊). You can get the PDF through either my Payhip or Etsy shops. What colours would you use for Night Sky? Do you have a favourite stargazer who would love to have it? I'm linking up with TGIFF and Beauties Pageant. I am no good at debating. Though I may know exactly why I think something is right or wrong, the moment I have to counter someone else's arguments, I forget everything I wanted to say. I can't think fast enough on my feet to keep up with another person who is convinced I'm wrong and has the arguments to prove it. Two hours later, on the other hand, I know exactly what I should have said to prove my point. It's very frustrating, I can assure you! Thankfully, I've never been in a situation where my lack of debating skills mattered much and the many times I lost my train of thought or otherwise couldn't compete verbally didn't result in anything bad happening. Unless you count my annoyance at not winning, lol. The Bible tells us, though, that in the end times, "there will be a time of great persecution. You will be dragged into synagogues and prisons, and you will stand trial before kings and governors because you are my followers" (Luke 21: 12). Now, that sounds exactly like the sort of situation where my lack of skills could cause very bad things to happen, don't you think? But Jesus, who is speaking to His disciples in this passage, isn't concerned. He goes on to say, "But this will be your opportunity to tell them about me" (v. 13). I'm sure it would be, if I could remember what to say under pressure! Fortunately, Jesus and I won't be relying on my abilities should this ever come to pass in my life. "So don’t worry in advance about how to answer the charges against you, for I will give you the right words and such wisdom that none of your opponents will be able to reply or refute you!" (vv. 14, 15). Isn't that a wonderful assurance? In what would probably be the most stressful moment in our lives, the words we would need in order to tell people about Jesus would be given to us and we would know exactly what to say. Not only that, but our opponents wouldn't even have anything to say back at us, our arguments would be so compelling. I have never experienced that with only my own words! Of course, we don't have to wait for the end times and the persecution they will bring to tell people about Jesus and He provides the words for those everyday moments, too. Peter is an excellent example. He, out of fear, denied even knowing Jesus while Jesus was on trial, but then after receiving the gift of the Holy Spirit on the Day of Pentecost, he "stepped forward with the eleven other apostles and shouted to the crowd, 'Listen carefully, all of you, fellow Jews and residents of Jerusalem! Make no mistake about this'" (Acts 2:14). What followed was a powerful sermon about Jesus and God's plan for salvation and "Those who believed what Peter said were baptized and added to the church that day—about 3,000 in all" (v. 41). 3,000! 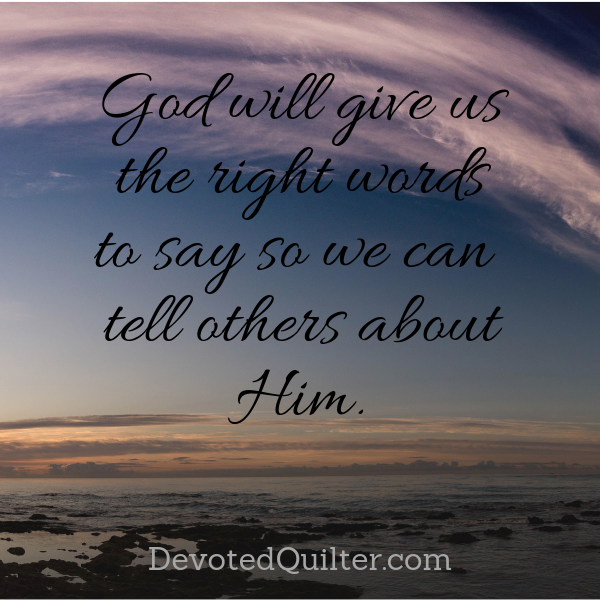 God will give us the right words to say so we can tell others about Him. With that out of the way, welcome to my stop on the Text It! blog hop, sharing the gorgeous and fun projects from Sherri Noel's new book, Text It! If this is your first time here, then an especially big welcome to you! I'd love to have you join in with my Medallion Magic QAL - we're cutting fabric right now, so you're not even behind. You can also sign up for The Bulletin, which I send to your inbox on the 16th of each month with news from here, a family favourite recipe and a collection of fun things to make. When you sign up, you'll also receive my Wind Farm quilt pattern, which is only available to subscribers. 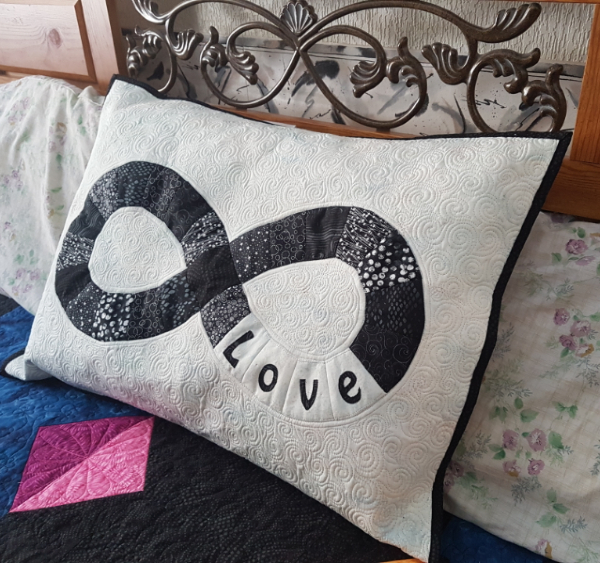 When I first looked through Sherri's book to see what project I wanted to make, I stopped dead at the picture of her Infinity Quilt. I may have even said out loud, "That one, obviously." 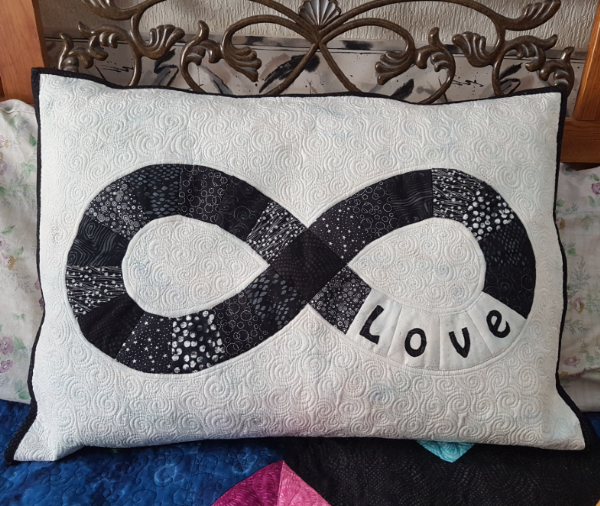 I chose to make the Infinity pillow sham, which is included as a variation in the book. The reason this was such an obvious project for me to make goes back to an evening when my husband called out to me from downstairs, where he sat at his computer. 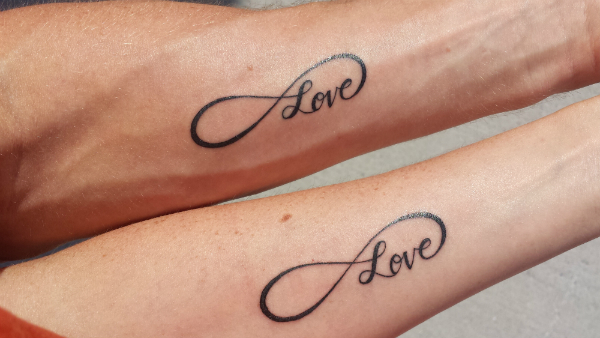 When I walked into the room, he said, "I found a tattoo I want to get." I was surprised, until I saw the picture on his screen, at which point I told him that if he was getting it, then I'd get it too. This particular tattoo was perfect for us because when we were dating and writing letters or little notes to each other, we'd always sign them with X's, O's and the infinity symbol. You should know that I had never once considered getting a tattoo until that moment, but a few days later, we had matching tattoos, which was how we celebrated our 15th anniversary. I debated for a while what colours to use for the infinity symbol. 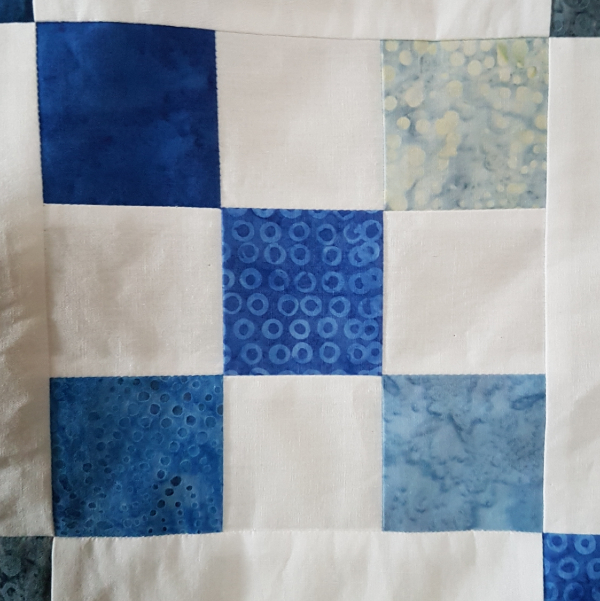 I thought about using the same fabrics that are in the quilt I just finished for our bed, of which you can see a sneak peek in the picture above, but I thought that might be a bit too matchy-matchy and boring. 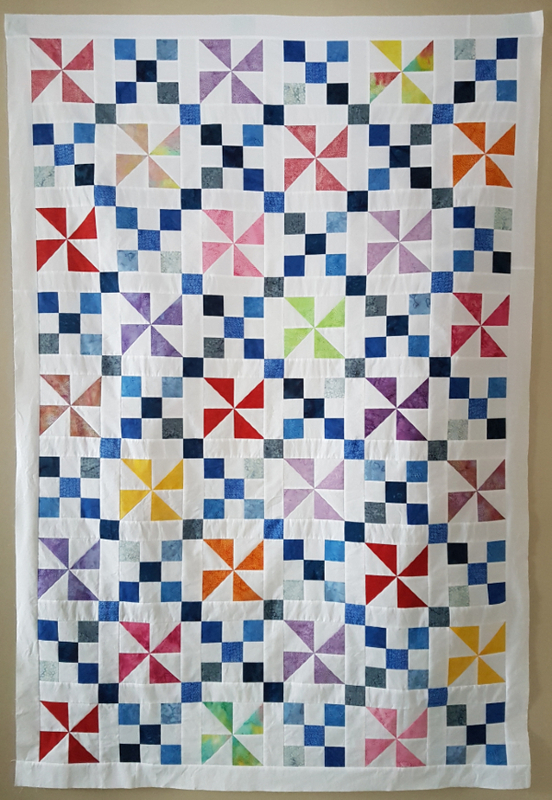 I thought about going crazy with scraps, but I thought that might detract from the quilt too much and I really wanted the two to work together. Then I thought of using all black scraps, with the pieces the letters are on made from the same fabric as the background so it would look as much like our tattoos as possible. As you can see, that's what I went with. I used Island Batik's Rice fabric for the background, which is so gorgeous, but doesn't really photograph well. There are faint streaks of blue-greens along with tiny dots of colour all over the fabric, which give the fabric a beautiful texture. 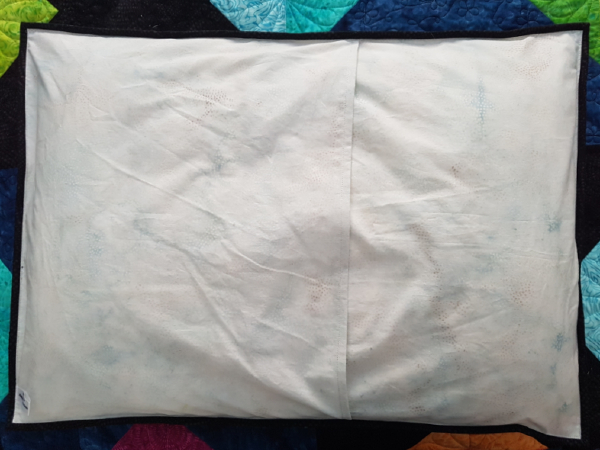 You can maybe see it a tiny bit better in this picture of the envelope back of the pillow sham. 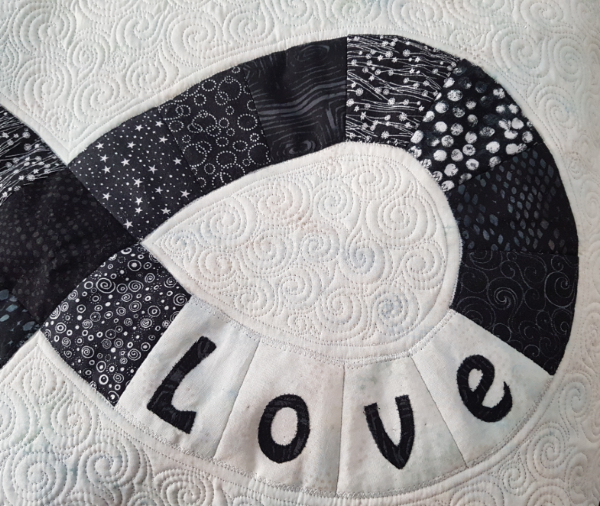 I used a few pieces of each of the black Island Batik fabrics I have and added a mix of other blacks from my stash for the letters and the EPP pieces that make up the infinity symbol. I've never done a binding on a pillow or cushion cover before, but I love the way it frames it. This is the first time, but it likely won't be the last. I used a scrap piece of Warm and Natural batting and the quilting is done with Aurifil 2600. My cone of 2600 is so close to empty now that I used 2024 in the bobbin because I didn't know if I'd have enough for both the top thread and the bobbin. I definitely wouldn't have had enough, so I'm glad I thought to use something different in the bobbin right from the start and saved myself from the stress of losing a game of thread chicken. I love the texture created by quilted swirl hooks, especially with the way the light comes into our room in the morning 😍 I might need to buy or make pretty pillowcases now so our regular pillows look as nice as this decorative one. A big thank you to Sherri for having me as part of this blog hop! Text it! 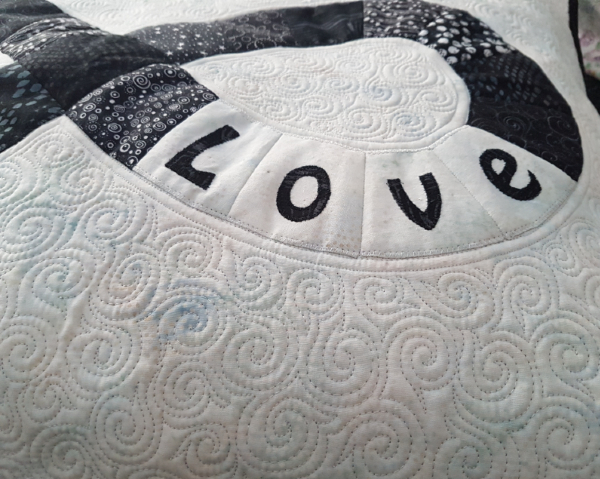 is beautiful and I highly recommend it if you like words on your quilts 😊 You can get a signed copy of the book directly from Sherri, or you can order a copy from Amazon. Before I send you off to see the other quilts and pillows with something to say, I have a giveaway you can enter, with two prizes. One is a copy of Text It!, which unfortunately is only available to a winner who lives in the US. 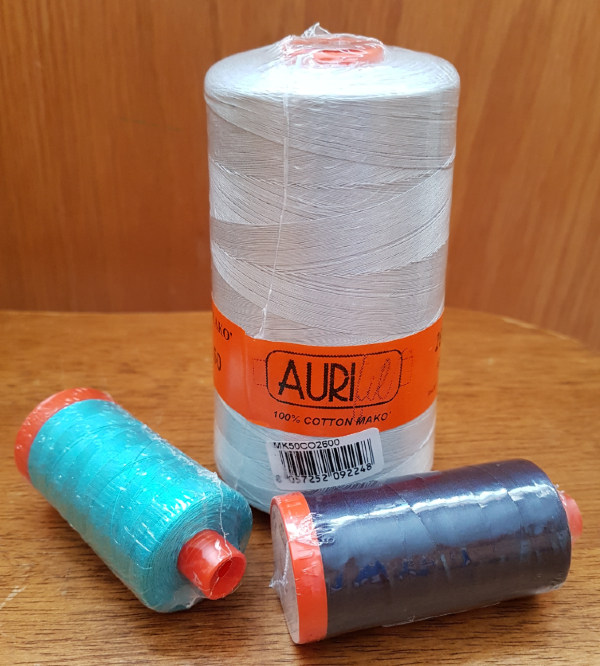 The other prize, 2 large spools of Aurifil thread, will be shipped anywhere in the world. To enter, leave me a comment telling me one special way you've celebrated an anniversary or birthday and be sure to let me know if you're in the US or not so I know if you're eligible for the book prize. For additional entries, follow me on Instagram or Facebook and leave a separate comment for each. And for one last entry, sign up for The Bulletin and leave another comment for that. I'll randomly choose the two winners on March 17th and contact them via email, so be sure your email address is either linked to your comment or include it in the comment. Edited to say - Congratulations to the giveaway winners, wlstarn (comment #7) for the copy of the book and Carol Andrews (comment #83) for the Aurifil thread. Now here's the schedule of other bloggers participating in the hop. Be sure to check out their versions of Sherri's fun designs! Our boys are usually the ones responsible for bringing in the wood we use in our wood burning furnace during the winter. Since the weather in the winter isn't always great for outdoor work, I have one standard I use for deciding when to send them out to bring in the wood - would I be willing to work outside in this weather? When it's really windy, the answer is probably no because the wind chill would make it too unpleasant. If it's fairly cold, but there's no wind, the answer is yes, I would, so out they go. To be honest, usually when I'm sending them out, I'm also wishing I could join them since I really enjoy bringing in wood! Alas, indoor work usually gets in the way. 'Would I be willing to do this?' is not a bad standard for when you're tempted to ask someone else to do anything. If you're not willing to do it, why are you willing to make them do it? It would seem God thinks 'would I be willing to do this?' is a good standard, too. Consider this story Jesus told: "When Jesus noticed that all who had come to the dinner were trying to sit in the seats of honor near the head of the table, he gave them this advice: 'When you are invited to a wedding feast, don’t sit in the seat of honor. What if someone who is more distinguished than you has also been invited? The host will come and say, ‘Give this person your seat.’ Then you will be embarrassed, and you will have to take whatever seat is left at the foot of the table! Instead, take the lowest place at the foot of the table. Then when your host sees you, he will come and say, ‘Friend, we have a better place for you!’ Then you will be honored in front of all the other guests. For those who exalt themselves will be humbled, and those who humble themselves will be exalted'” (Luke 14:10). Jesus often needed to correct His disciples for their inclination to worry about being honoured, which is exactly what He was doing with this story as He saw everyone trying to get the best seats at the dinner party. People aren't much different now, are they? We all want to be 'properly' honoured or given what feels to us like the right amount of attention and prestige. Just think about how easily we can be convinced that we need the 'prestige' version of a credit card or other service. We like to think of ourselves as important and worth the honour. Jesus tells us that we're going about it all wrong. We should be humbling ourselves, not in a fake way that is really just a ploy to get people to correct us and so give us the honour we already know is due us, but we should honestly "Be humble, thinking of others as better than yourselves" (Philippians 2:3). What does this have to do with the question, 'would I be willing to do this'? Well, Jesus is telling His followers to humble themselves, which most would consider a difficult way to live. Would He be willing to do it Himself or is He asking us to do something He wouldn't be willing to do? We find our answer just a couple of verses later in Philippians 2: "Though he was God, he did not think of equality with God as something to cling to. Instead, he gave up his divine privileges; he took the humble position of a slave and was born as a human being. When he appeared in human form, he humbled himself in obedience to God and died a criminal’s death on a cross" (vv. 6-8). 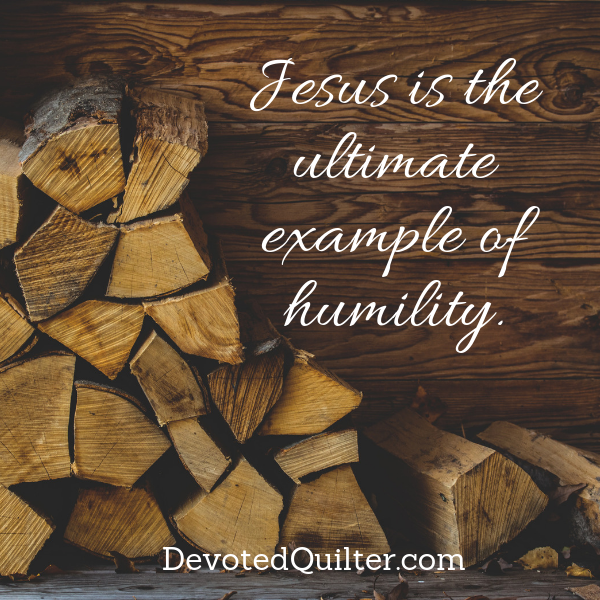 As in so many other things, Jesus is our model when it comes to humbling ourselves. Think of all the honour that is due Him as the Son of God. Then think of how He came into our world, born in a stable rather than the grand palace He deserved. Think of His life as the son of common people, trained as a carpenter like His earthly father and then ministering to the masses with "no place even to lay his head” (Matthew 8:20). He never sought special treatment or special honours. Jesus' whole life is an amazing example of humility, capped by the ultimate example when He allowed Himself to be crucified so that He could save us. We have ample proof that He was willing to humble Himself just as He teaches us to do. Now it's up to us to follow His example. I can't believe it's my 6 year blogging anniversary! Where does the time go?? 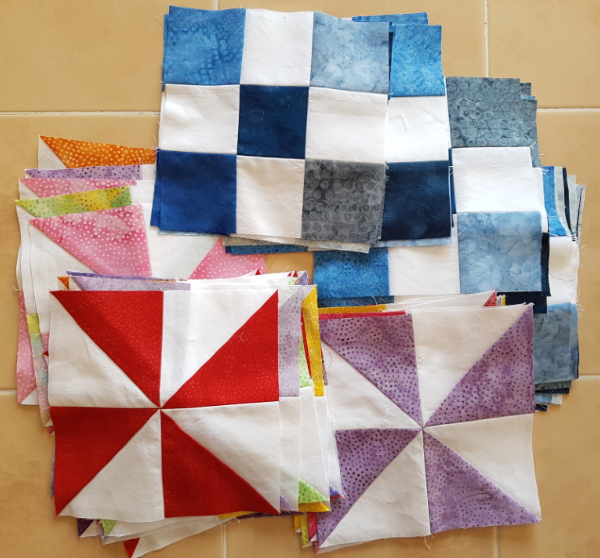 Since I don't think anyone was following me way back then, here are the posts from my first month of blogging, complete with my beginner free motion quilting progress. 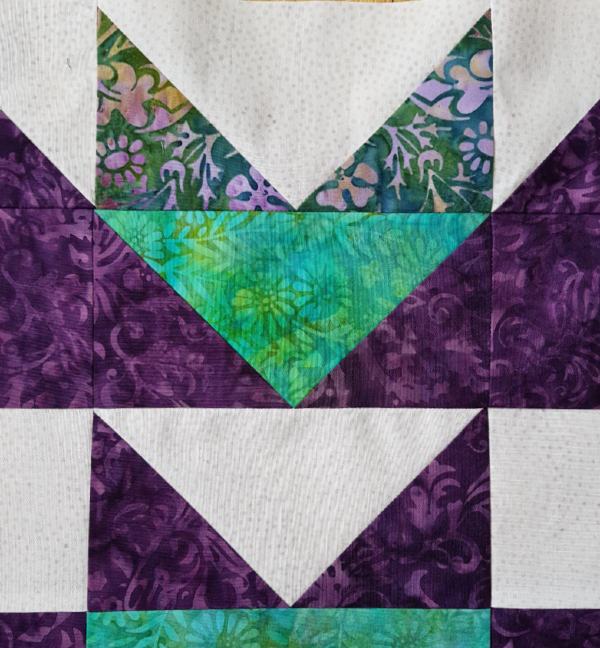 Note that the hexagon quilt in one of the posts is basted, but not yet quilted, lol. Maybe I should try to get that finished. It has been an amazing 6 years, thanks to your comments and friendship 😊 Thank you for reading my thoughts and for being so enthusiastic about the (many) things I've made over years. Your support and encouragement have meant so much to me! And, of course, the inspiration from reading your blog posts and seeing your pictures on IG is one of the reasons my to-make list is several miles long. 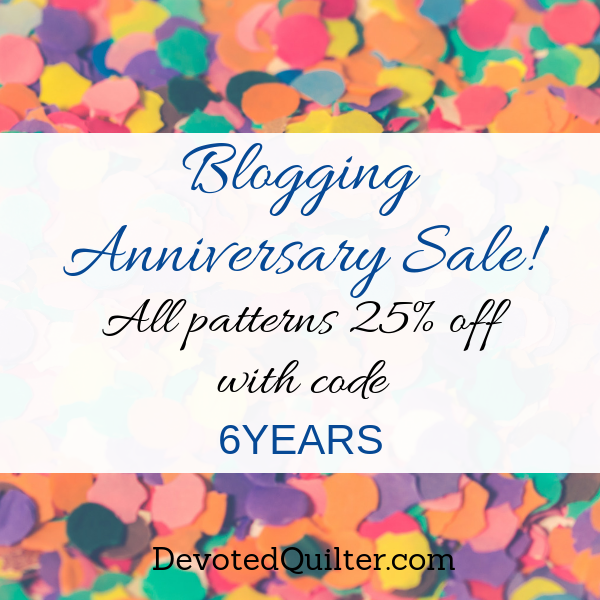 To celebrate, I'm having a Blogging Anniversary Sale, with all of my patterns 25% off from now through March 6th with the coupon code 6YEARS.